106. St. Jacob's -Heidelberg Loop - 15 km. Start/ End on CR8 in St. Jacob's. This short tour gives you a taste of the Mennonite heritage of this part of Ontario as you cycle through farm and town. 107. Conestogo - Alma Excursion - 58 km. Start/ End in Conestogo on CR17. This long tour takes you through productive farmland, Mennonite country, the vibrant village of Elora, situated around a beautiful gorge on the Grand River, and other small, thriving communities, such as Elmira. 108. Grand River Sampler - 56 km. (full loop) Start/ End in Elora on CR7 at David Street. Follow CR7 across river to Jct. CR21. Turn right and follow through Inverhaugh to West Montrose. Be sure to cross the covered bridge. Return toward Elora. At Jct CR7, you can return to Elora, or keep going past the Wellington County Museum to Fergus. At Fergus, you can cross the river and return to Elora, or you can continue north east to Belwood and Belwood Lake, returning along CR18 (busy tourist traffic at times) or the Elora-Cataract Rail Trail. 109. St. Agatha - Wellesley Loop - 48 km. Start / End in St. Agatha, west of Kitchener-Waterloo on CR9. Travel through rolling farmland to the various pretty villages, such as Heidelberg, Wellesley, Bamberg and Baden. 111. Wilmot- Blandord Blenheim Townships Tour - 50 km. Start / End at the Giant Water Wheel in New Hamburg. Follow Bleams Rd. out of town, across Hwy 7/8 to Punkeydoodles Corners. Pass through Plattsville and New Dundee and numerous villages on this pleasant, moderate tour. 112. West Guelph Loop - 30 km. Start/ End on Wellington Street in Guelph. Head west on Wellington. West of Hanlon Parkway, pick up Fife Rd. and follow. Pass through rolling farmland on the outskirts of Guelph. 113. Guelph Lake - Acton Tour - 70 km. Start / End at Guelph Lake CA on Watson Rd. The rolling farmland, mature trees, and the pretty villages of Rockwood, Acton and Eden Mills make this varied tour pleasant. 114. Guelph - Campbellville Excursion - 70 km. Start/ End in Guelph on Stone Rd. at Gordon, near the University of Guelph. This long tour has a challenging hilly section near Campbellville, but provides you with a variety of landscapes as you discover Puslinch Township and Halton Hills. 115. Campbellville Loop - 42 km. Start / End in Campbellville. Head west along CR9. This tour features a number of hills. Remember there is always a view at the top. 118. East Luther - Grand Valley Excursion - 65 km. Start / End in Grand Valley on CR25. This long tour features wideopen spaces and windy treed stretches as it travels from the Grand River to the Luther Marsh. 119. Shelburne Tour. 65 km. Start/ End in Shelburne on Hwy 89. This tour through Dufferin County features a loop and an out and back ride to Terra Nova along the Pine River. 120. Dundalk - Flesherton - 70 km. Start/ End in either Dundalk or Flesherton. This tour allows you to avoid the shortest path between these two towns. Enjoy this diverting tour through the countryside of Artemesia, Osprey and Proton Twps. Mainly flat open countryside. 122. Elora - Fergus Loop - 14 km. This short tour takes you along the Grand River and past the Wellington County Museum and allows you to enjoy two of the prettiest towns in the province. Begin in either community. 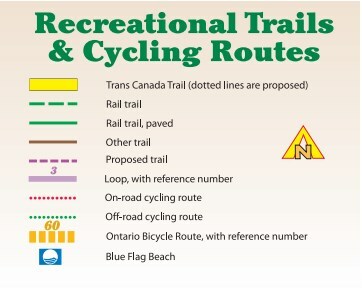 You could choose the Elora-Cataract Rail Trail for one leg.